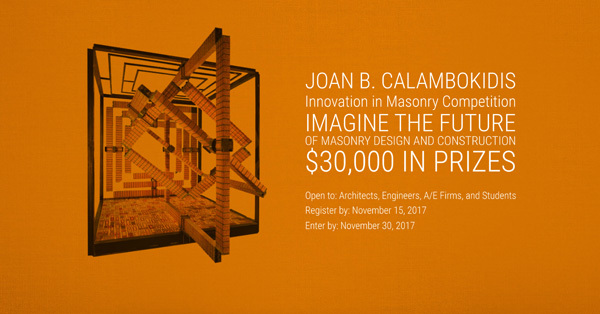 The inaugural Joan B. Calambokidis Innovation in Masonry Design Competition challenges architects, engineers, students, and firms to imagine the future of masonry design. Participants should rethink the innovative potential of masonry construction by exploring approaches to energy efficiency, resiliency, sustainability, and mass customization. Use of BIM, computational design, and emerging construction and manufacturing techniques is also encouraged. All designs must incorporate one or more of the following materials: brick, concrete block, tile, marble, terrazzo, stone, and plaster. 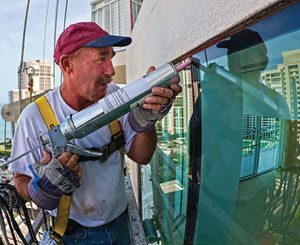 Solutions should address both the aesthetic and structural nature of masonry assembly. The proposed project could be a building; exterior building element such as a wall, floor, or roof assembly; or other concept construction. The competition invites creative freedom to allow designers to innovate without restraint. Three grand prize winners will be awarded across three categories: students; young architects and engineers; and firms, multidisciplinary teams, and individual architects/engineers. 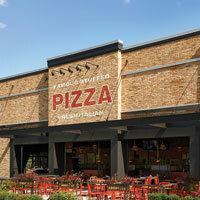 In addition to monetary prizes, winners may receive special publication and promotion opportunities, and will be honored during an awards ceremony in Miami, Fla. Travel and accommodations to Miami will be provided by the International Masonry Institute (IMI) for up to two individuals from each winning category. For more details on the competition and how to enter, visit http://imiweb.org/jbcaward.